In April 2001, a Pakistani man granted refugee status set himself on fire outside of the Australian Parliament House. His self-immolation was presumably a protest for prolonged delays and frustrations surrounding reunification for his family spanning five years. Visas for his wife and three daughters were rejected because his second daughter had cerebral palsy, deemed to impose significant costs on taxpayers. The man died within two months due to his burns and organ failure. The Commonwealth Ombudsman was critical of the Immigration Department's treatment of the man. But despite a 2003 coronial inquest, there was scant evidence on the immediate precursors to the tragedy, and in 2005, the ACT Coroner cleared officials of blame. In 2008 disability migration was examined more closely, after media reported public disquiet surrounding the migration case of Dr Bernhard Moeller. The Horsham physician's application for permanent residency in Australia was rejected because one of his children has Down's Syndrome. Then Minister for Immigration, Chris Evans intervened and the regional medico and his family were permitted to stay. But the issue highlighted the seemingly unreasonable health requirements in Australia's migration laws. Within months, the Immigration Minister and the then Parliamentary Secretary for Disabilities, Bill Shorten, asked the Joint Standing Committee on Migration to inquire into the health requirement in the Migration Act. An inquiry report was all but lost in the media storm surrounding the Labor leadership change of June 2010. The report, Enabling Australia, offered an impressive analysis and a persuasive argument for change. The committee sifted through over 100 submissions and many stories of potential migrants who were forced to handle tricky migration scenarios at the same time as managing disability or its diagnosis in their children. Politicians of various ideologies worked together to produce a suite of recommendations that were specific, achievable and compassionate. The committee's recommendations were unanimous. During the 2010 election campaign, numbers of refugee advocates, concerned Australians and potential eventual citizens hoped the recommendations would be supported and implemented by any prospective government. A month ago, the Minister for Immigration Chris Bowen answered some of those hopes when he announced 'a fairer approach to migration for people with disability'. This time Superstorm Sandy, the US election, and discussion surrounding the excision of Australia's mainland from its migration zone, overshadowed the news. The fact that the changes were announced concomitantly could be interpreted as a strategic political tactic. The bizarre and populist excision policy draws attention from the more humane policy modification, which could easily be presented as catering to Greens and other 'bleeding hearts'. The new 'net benefit' approach to disability migration will see decision makers consider the advantages of accepting an immigrant, not just health and disability status. The 'Significant Cost Threshold' will be increased by more than 60 per cent, to $35,000. In its full response to Enabling Australia, the Government agreed that the health requirement 'be updated and improved'; it was subsequently reviewed by the Department of Immigration. Most other recommendations were agreed to or supported in principle. However four of the unsupported recommendations are significant. First is the recommendation to amend migration regulations to assess diseases and medical conditions separately to disability; and second, removing cost assessment 'regardless of whether the health care or community services will actually be used'. So, even when care or services are unlikely to be used in connection with the disability, or migrants have requisite financial resources, cost remains grounds for rejection. Third, although the Minister has discretion in other migration issues, this power does not include migration decisions relating to health or disability. The opinion of a Commonwealth medical officer must be accepted. Change of this element was also recommended, and unfortunately also rejected. 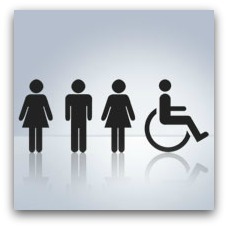 Those engaged in disability know that many disabilities are rare or complex, and diagnosis frequently proves elusive. Finally, a review of the migration exemption in the Disability Discrimination Act 1992 was ruled out. Perhaps the Government was being more prudent in its treatment of migrants with disabilities at a time when preparations for its National Disability Insurance Scheme were underway. Taxpayers would not want Australia to establish itself as a migration destination based only on its disability policy. But disability itself does not discriminate; people of every background, age group and gender are affected across every nation. And disability does not take into account the many different capabilities of those same people. Sadly, although Australia seeks to minimise discrimination in many other areas, the contentious issue of immigration means that ongoing disability discrimination in migration is unlikely to disappear anytime soon. Moira Byrne recently completed a PhD in political science at the Australian National University, examining religious refugee pressure groups, and is a disability advocate. She currently works part-time in social policy and as a researcher. I feel sorry for this man and I feel sorry for those who wait in queues to come to Australia, having little money and undergoing great red tape before even stepping on land in Australia. By contrast those with money to fly to Malaysia, money to pay people smugglers and methods of deception in throwing away passports and other identity documents, get more favourable treatment and more likelihood of staying here. No wonder those who came to Australia through legal channels, waiting for years to be approved, are disappointed and distressed with this government's irrational policy. And as for the Greens, they simply do not understand what is going on - the people smugglers are getting richer on their blindness. Skye, perhaps if you had read this article you might appreciate that this is not an opportunity for more bile and misinformation about asylum seekers. There is no queue. Australian Government policy settings which deny family reunion act as a pull factor for people coming by boat. It is almost impossible for refugees to reunite with family and even more so, if a family member happens to be disabled. It has nothing to do with 'waiting patiently' to come through 'legal channels' because those legal channels don't exist. I thought 'those people with money' jumped onto a commercial flight with a legitimate visa and then overstayed to become a 'planeperson' but no one seems to notice or care about them, particularly the media and Al Jones, to say nothing of the LNP people. Skye, Nothing of what you say has any bearing on the right to seek asylum and no bearing on this story. Kate, my point was that whatever difficulties refugees have gone through and are going through, it is the ones with money who are able to jump across into Australian territory by means of people smugglers and a lot of cash. My Vietnamese, Lebanese, Syrian and Egyptian friends are the ones most distressed by the illegal methods of crossing the line as they went through the legal processes and all this involved to come here. Coming here the illegal way was not open to them as they did not have that kind of money. I know the doors have closed to many of these former legal ways and it is a great pity as the poorest of refugees - and as pointed out - those with children with illnesses and disabilities, have a very difficult process to endure. It is the refugees who came to Australia with nothing in the past few decades who stare at disbelief at this government's handling of the illegal arrivals and lament the way things are turning out. I have no bile but am listening to what they say. I feel sorry for the poorest of the refugees who do not get a look in. There were so many refugees who came with nothing over the years and made such a good go of it here and who love this country deeply. The utilitarian assumption is of course, that anyone with a disability cannot contribute to society and we must have a demonstrable 'net benefit'. I have two answers to that: St Leopold and Eric Bogle's song "Rosie". "Rosie" can be found at http://www.youtube.com/watch?v=OTZYUBm719Q I defy anyone to listen to it carefully and remain unaffected. Saint Leopold Mandic's life is characterised by the contrast between his physical frailty and his spiritual strength. He was born; and spent his whole life physically weak. He only reached 4ft 5ins (135 cm) in height and his general health became worse as he grew older. He suffered from abdominal pains, and was gradually deformed by chronic arthritis in later life, making his frame stooped and his hands gnarled, giving him much pain. He also suffered from a stammer in his speech. But spiritually, Leopold Mandic was a giant, full of Christian strength. It was his humility and faith in God's Goodness and Providence that enabled him to recognise and accept his poor physical condition, which in turn led him to realise that without God he could do nothing. This strong faith was communicated to others when they came to Fr Leopold for spiritual advice. He would say: "Have faith! Everything will be alright. Faith, Faith!" Skye, the amount of money people have has never been part of the test of refugee status under the Convention: it is 'a well founded fear of persecution'. You do not know the individual circumstances of people claiming asylum. They cannot come through legal channels because in most instances those channels simply do not exist or as such that people have to put their lives on hold indefinitely. Most of the Vietnamese refugees who came to Australia fled to other countries first, often by boat, and were resettled here under a regional arrangement that Malcolm Fraser was instrumental in establishing. Such regional frameworks do not exist today. You do not know how many of those people arriving today by boat have faced torture, loss of families members, fear and harassment by their governments. Demonising asylum seekers as you do adds to people's trauma and actually makes life even more difficult for refugees already in the community because it undermines their status and legitimacy. SKye had never once explained her objection to people paying someone else to save them from death so I presume Skye would never pay anyone to save her from death. I presume Skye would just happily die?